A new I-79 interchange in Morgantown, West Virginia connects the region to new development while solving traffic congestion problems. Burgess & Niple worked with the West Virginia Department of Transportation (WVDOT) to complete a design study for the new interchange that provides access to 180 acres of land that includes hospital facilities, offices and a new baseball park. The two existing I-79 interchanges in the Morgantown area were congested during peak hours with traffic volumes projected to increase with development. Adding an interchange helped alleviate congestion, reduce traffic conflicts, improve safety and increase capacity. The design study completed by B&N evaluates interchange and alignment options. In addition, the team provided 30 percent construction plans that were used in the bidding process for this $22 million design/build project. To meet the developer’s aggressive schedule, the B&N team completed this large-scale project in just six months. This included close collaboration with the developer to align roadway designs with development needs. 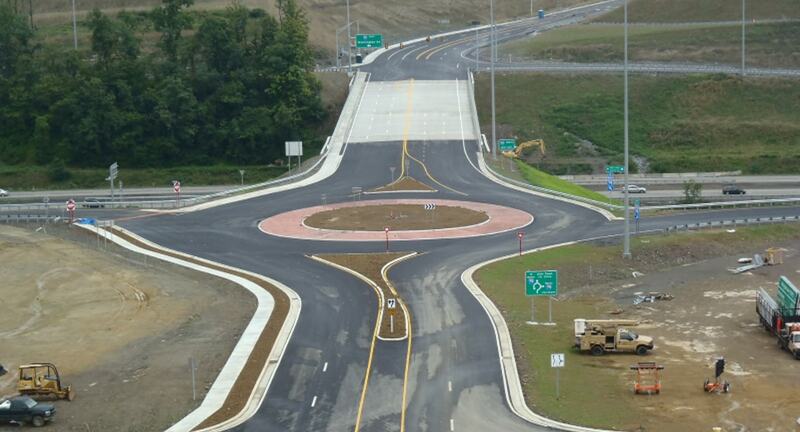 WVDOT implemented a traditional diamond interchange with a roundabout at the southbound ramp intersection. Selected as the preferred alternative during public meetings, this design is expected to meet the heavy demand for left turns. It increases capacity by efficiently moving two lanes of traffic through the intersection during both the morning and evening peak periods. The West Virginia Department of Transportation Division of Highways selected the I-79 project to receive its 2014 Engineering Excellence Award in the Large Roadway Category.